In the 1960s, Edna Staebler moved in with an Old Order Mennonite family to absorb their oral history and learn about Mennonite culture and cooking. From this fieldwork came the cookbook Food That Really Schmecks . Originally published in 1968, Schmecks instantly became a classic, selling tens of thousands of copies. Interspersed with practical and memorable recipes are Staebler's stories and anecdotes about cooking, Mennonites, her family, and Waterloo Region. Described by Edith Fowke as folklore literature, Staebler's cookbooks have earned her national acclaim. 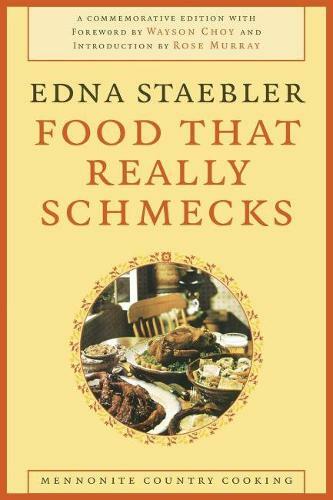 Including this long-anticipated reprint of Food That Really Schmecks in our Life Writing series recognizes the cultural value of its narratives, positing it as a groundbreaking book in the food writing genre. This edition includes a foreword by award-winning author Wayson Choy and a new introduction by the well-known food writer Rose Murray.